Flair magazine was the creation of Fleur Cowles, whose then-husband number three Gardner Cowles was president of Cowles Magazines, Inc., which published “Look” magazine. A 50-cent package of high-society, art, literature and fashion, the magazine was published from February 1950 to January 1951, and even then it was considered ahead of its time. The mag’s diverse group of contributors included W.H. Auden, Tennessee Williams, Gypsy Rose Lee, Simone de Beauvoir, Salvador Dali, Jean Cocteau, Margaret Mead and Tallulah Bankhead. Lavishly produced, it included die-cut overlays, different paper stock within single issues and accordion inserts and fold outs. Inevitably Gardner Cowles ceased production, after losing an estimated $2.5 million on Fleur’s Flair. Though she went on to travel the world, socializing with and writing about luminaries, (and marrying once more) Fleur considered the magazine she lovingly crafted during those 12 months at the beginning of the 50s as her legacy. A comprehensive 1996 Amy Fine Collins profile of Fleur from Vanity Fair is here. I’ve collected some issues of the magazine over the years, I’ll do my best to scan them and share some highlights. At the risk of speaking blasphemy about an artifact revered in some circles as positively iconic, when I look at these issues, I can’t help but think Fleur was a bit of a snob. But that’s part of the fun. Blogging about Flair’s nothing new. You can find bits here and there online. However, check out the scarf above! Wouldn’t it be cool to come across one of these somewhere? It makes me wonder who ordered them. If you could afford the magazine and all it heralded, would you stoop so low as to wear a scarf emblazoned with its name? 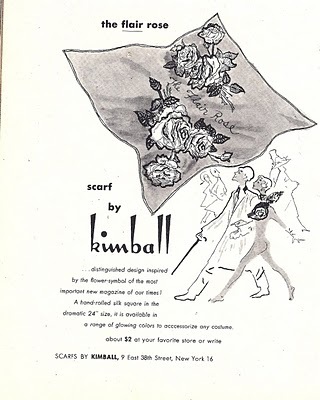 You have now ensured that I must undertake a fanatical Ebay quest for a Flair Magazine scarf. Your blog is still one of the best in the sphere.